Electric cars have been around since the 19th century, so they're not exactly space-age technology. But the recent surge in electric vehicles springs, at least in part, from NASA know-how. A carmaker, Hybrid Technologies Inc., signed a deal with NASA's Kennedy Space Center in 2006 to help test and improve the lithium-ion battery systems in its vehicles. With NASA's contributions, the company, now known as Li-Ion Motors, was able to deploy New York City's first all-electric taxi and develop a broad range of other lithium-powered vehicles, including converted PT Cruisers and Mini Coopers. With its long history of battery development and testing, NASA was a natural partner for an aspiring electric-car maker. Many of the space agency's craft rely on battery power. The moon buggy, for example, was powered around the lunar surface in the early 1970s by non-rechargeable silver-zinc potassium hydroxide batteries. The Mars Opportunity rover — which landed on the Red Planet in January 2004 and is still going strong — is primarily solar-powered, but rechargeable lithium-ion batteries store energy for use at night. The batteries that power rovers, satellites and other spacecraft must be reliable and robust. They must be able to withstand the jolts and shudders of a launch, and they must be able to work in tough conditions — in extreme heat or cold and high radiation, for example. Their premature failure could end the mission, since replacement or repair would be either difficult (and expensive) or simply impossible. Li-Ion Motors, which is based in Las Vegas, converts cars, trucks and other vehicles to run on rechargeable lithium-ion batteries. In March 2006, the company entered into a Space Act Agreement with the Kennedy Space Center. Under the deal, the company supplied a fleet of electric cars — including PT Cruisers, smart cars and high-performance all-terrain vehicles — for KSC engineers to use and test. 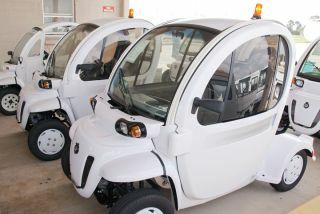 The aim was to help determine the utility of lithium-powered vehicles, and to that end the NASA engineers studied the cars' advanced battery-management system. NASA's efforts helped improve the vehicles, and the company soon was selling them. Lithium-powered Mini Coopers and smart cars were available in the 2007 Sam's Club catalog. These days, electric vehicles are becomingincreasingly common on highways around the world, and many carmakers have gotten into the game. This surge is due in large part to improvements in lithium-ion batteries that allow cars to go farther on a single charge. Meanwhile, NASA engineers are working to improve lithium-ion systems for spacesuits, to make the batteries less prone to "thermal runaway" — when batteries heat up dramatically and, in some cases, explode. These improvements are likely to find their way to the road at some point, too, making next-generation electric vehicles more robust and more reliable.